United States Capitals and Symbols: These activities will help you learn how the United States came to be united. Study the state capitals and symbols with fun online games and free printables. 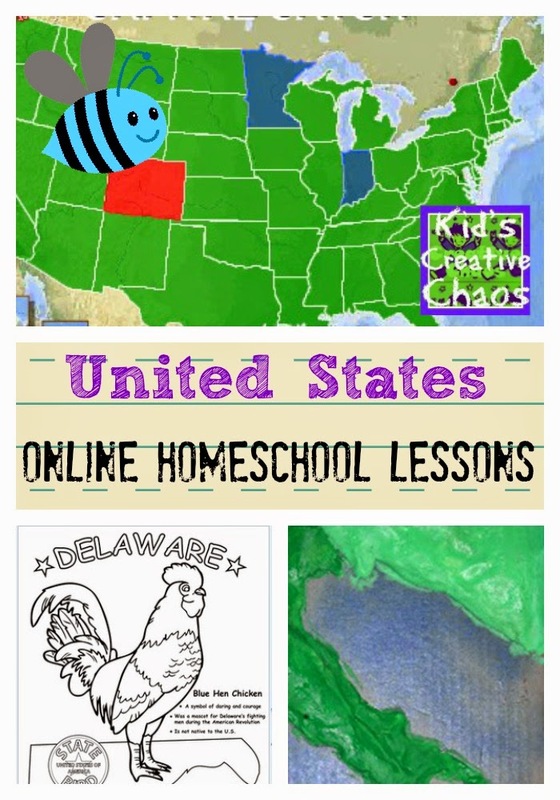 Each of our free online homeschooling lessons includes language arts, social studies, science, and art components. Whenever possible, we also include math and PE. Scroll down for online games and activities. Enjoy! Lesson Ideas for the United State symbols for early elementary. Do this: While you are studying the state capitals, make an index card for each state. On the front write the state’s name in the CENTER of the card in big, bold letters. On the back, write the name of the state’s capital. As you learn facts about each state, draw pictures on the card to represent them. For example, for Indiana decorate your card with the Cardinal (state bird) and Corn (state resource). Cartoon: Sing the 50 state capitals with Wakko of Animaniacs. Downloadable Blank Maps of all 50 states. Now, you're ready to practice what you've learned with this cool Capital Catch Game from kidsgeo.com. Match Capitals with States Online Game. State capital matching game and quiz from kidsgeo.com. Click the link above to play game. Find out here: Statehood Dates. Why do we have fireworks on the Fourth of July? Answer this in your daily journal. Read How did the American Revolution happen? If you subscribe to Brainpop, watch the video here. Grab a piece of paper (or use a Google Doc) and tell how the American revolution happened? Why did it happen? Because of all of that, America became a melting pot. How are you doing? Test your knowledge with a State Capitals Quiz. More about the U.S. Constitution from Brainpop.com (subscribers only). Let’s get messy! Make your own 3D map of the United States activity. You will need tempera paint, flour, salt, water, and some cardboard. Remember: Baking and Making is science too! See how to do it at Weird Unsocialized Homeschoolers. How to make a 3D United States map with salt dough. Grammar Monster explains the difference between capital and capitol. Be sure to scroll past the quick answer to learn more about capital vs. capitol. What is the state bird for __________________? (fill in your state and bird). Optional: Research why your state bird was chosen. Become a bird watcher in your state and Research Birds of the United States. Follow the link to learn about typical and rare birds found in each state. Find out how you can help report rare bird sightings. Early Elementary Component Pre-K - 3, but suitable for older kids too! Free online matching game: Match the United States symbols. Name 3 United States symbols. On a separate sheet of paper, draw the symbols with crayons or markers. Play this fun game from Funbrain.com: Where is that? From Cool-Mathgames.com: State Snap match the states shape game. Fun Activity: Collect United States State Quarters. Each quarter has special information about the state it represents. The U.S. Mint has lots of online games and videos. We've got an online lesson on how to make money - okay, it is really about how they make money at the mint, but how to make money sounds more exciting! A Picnic in October * - A story about the Statue of Liberty.